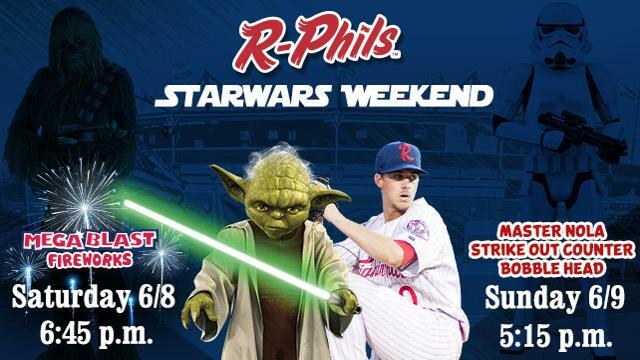 The Fightin Phils are set to celebrate Star Wars Weekend on June 8th and 9th with an exciting giveaway for children and an enormous fireworks display for all. The fun kicks off on Saturday, June 8th with a Star Wars tribute, featuring Star Wars character appearances and a pregame mascot band concert thanks to BB&T. First pitch between the Fightins and the Harrisburg Senators is set for 6:45 p.m. Following the game, fans won't want to miss the return of Carpenter MEGA BLAST Fireworks, thanks to Shady Maple Farm Market. It's the largest fireworks show in the history of FirstEnergy Stadium, featuring a special Star Wars theme. On Sunday, June 9th, the first 2,000 kids will take home a "Master Nola" Strike Out Tracker bobblehead, featuring Phillies ace and former Reading Fightin Phil, Aaron Nola, thanks to CJ's Tire & Automotive. Star Wars characters will be on hand for a photo session beginning at 3:30 p.m., and first pitch will take place at 5:15 p.m.
Fightins players and coaches will be sporting Star Wars themed hats and jerseys throughout the weekend, and the jerseys will be available for auction. The Reading Area Community College Game Worn Jersey Auction will benefit the United Way of Berks County. Fans can bring a blanket and take the field after Sunday's game for a viewing of "Solo" on the grass, or enjoy the show from their seats, thanks to Commonwealth Charter Academy. June 9th is also Sunday Family Fun Day, with four tickets, four hotdogs, and four sodas available for just $42. Don't forget to bring along those canine companions - dogs are allowed everywhere throughout the stands, courtesy of Humane Pennsylvania. Group and season tickets are available now at https://www.milb.com/reading/tickets/. Individual game tickets will go on sale at 9 a.m. on Saturday, February 23rd at the Weidenhammer Ticket Office at FirstEnergy Stadium, online at fightins.com, or over the phone by calling or texting 610-370-BALL.